A close-up image of the surface of Charon reveals few craters and a peculiar feature: a mountain with a moat around it (at upper lefthand corner of inset). The photo was captured by NASA’s New Horizons probe on July 14, 2015, from 49,000 miles (79,000 kilometers) away. Pluto's big moon Charon keeps getting more and more interesting. 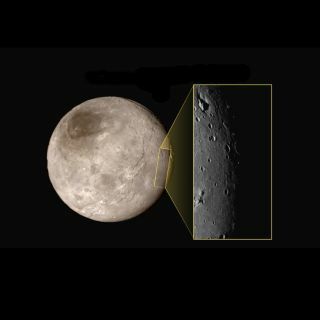 A newly released Charon photo, which was taken by NASA's New Horizons probe during its epic Pluto flyby Tuesday (July 14), reveals a mountain rising out of a big hole on the 750-mile-wide (1,200 kilometers) moon's surface. "This is a feature that has geologists stunned and stumped," added Moore, who leads New Horizons' geology, geophysics and imaging team. The new image covers an area about 200 miles long (320 km) from top to bottom, NASA officials explained in the statement. New Horizons captured the photo on Tuesday morning from a distance of 49,000 miles (79,000 km). About 80 minutes later, the spacecraft reached its closest Pluto approach, zooming to within just 7,800 miles (12,500 km) of the dwarf planet's frigid surface. So there will be even better images of Charon — and of Pluto and its other four moons — coming down shortly. Indeed, NASA will hold a news conference tomorrow (July 17) at 1 p.m. EDT (1700 GMT) to unveil and discuss the latest photos and discoveries from New Horizons. You can watch it live here at Space.com, courtesy of NASA TV. The $723 million New Horizons mission launched in January 2006 to lift the veil on the Pluto system. The spacecraft gathered reams of data using seven different science instruments during its highly anticipated flyby. It will take up to 16 months for New Horizons to beam all of these observations back to its handlers on Earth. But the few up-close images analyzed and released so far have revealed Pluto and Charon to be complex and surprising worlds that have been geologically active in the recent past. New Horizons spied 11,000-foot-high (3,500 meters) ice mountains on Pluto, for example, as well as Charon canyons up to 6 miles (10 km) deep.